There’s a wealth of treasures to explore in the New Forest from gardens to wildlife parks, museums to quaint country towns, etc. The list of options is endless, and Christchurch Harbour Hotel & Spa was a cozy hotel from which to do all this from. As the name suggests, the hotel is perched on the harbour, and the hotel’s restaurant, Upper Deck, opens up onto a patio that leads right to the water’s edge. We didn’t get the best weather during our visit, but on a sunny day the unobstructed views promises to be nothing less than spectacular. The Chef Patron of Upper Deck Restaurant is Alex Aitken who earned a Michelin star in 1995 with his first restaurant, Le Poussin, a star that he retained for 14 years. The menu is classically British and draws on produce from the local area. The restaurant combines country comfort with coastal chic for a relaxing, yet stylish atmosphere. 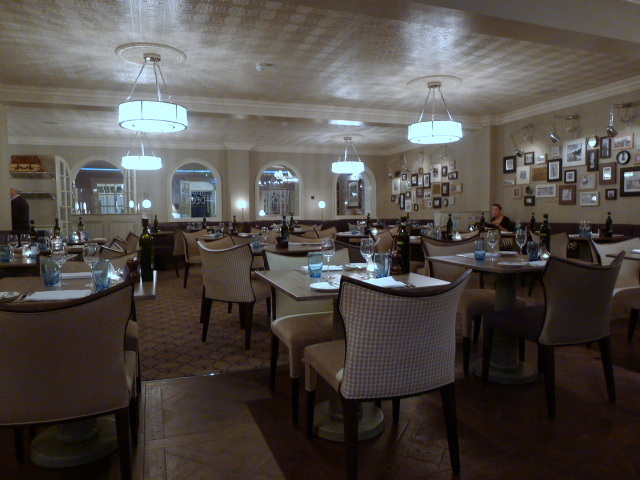 There is also an elegant bar area where you can caress a few drinks before hitting the restaurant proper. It also serves a few bar bites where we tried the tempura prawns (5 pieces – £5.95) with a sweet dipping sauce and Poole Bay rock oysters out of the shell (£1.95 each). Both were delicious and fresh. There was a nice crunchiness to the batter, and the prawns were firm and sweet. 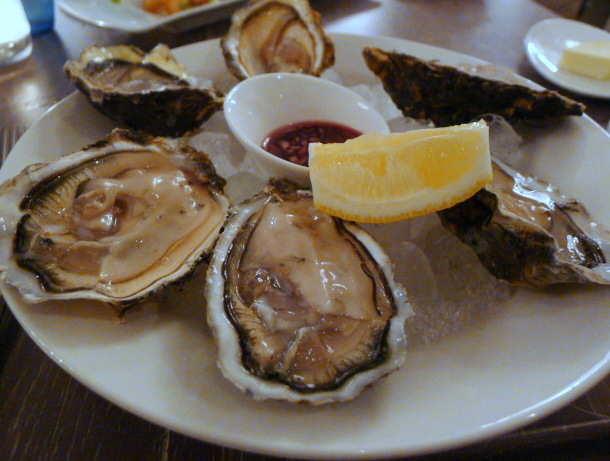 The oysters were fleshy and earthy but had not been completely removed from the shell. 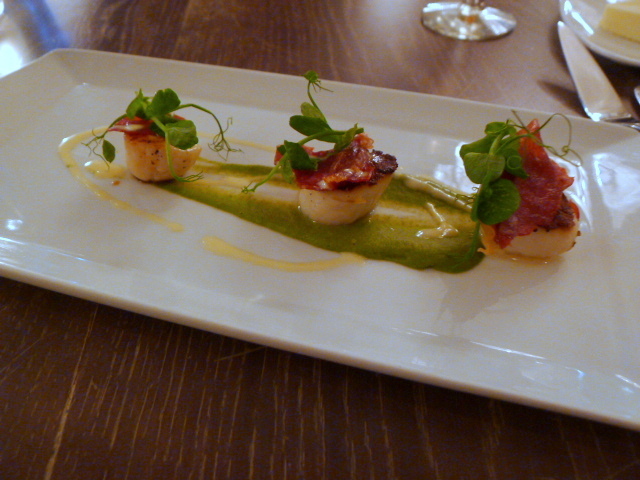 A starter of Dorset scallops with pea purée, crispy cured ham and pea shoots (£11.50) was lovely, with the delicate scallops combining harmoniously with the creamy purée. The super crispy ham added a nice textural contrast to the dish. 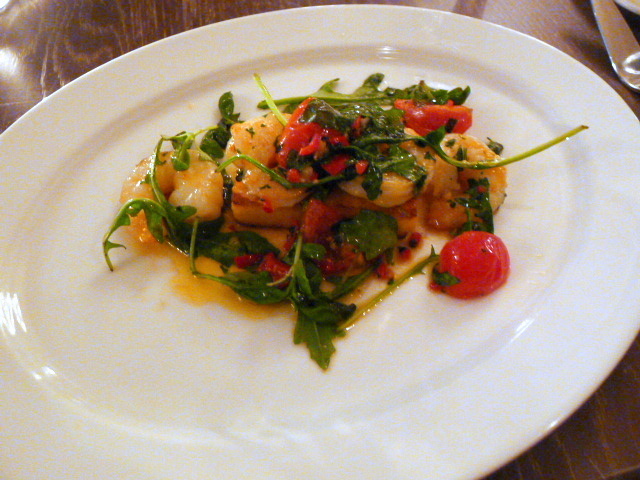 Tiger prawns (£9.50) were sweet and firm, and blended with a tasty cherry tomato, chilli and garlic sauce. Fresh basil ran through the dish to give it a lovely aroma. Both starters proved accomplished and tasty. Fish mains seemed appropriate given where we were staying, but both our fish courses fell short. A fillet of cod with a crab and herb crust (£21.95), mash and crushed peas was dry. The herb crust could also have been crunchier for a greater textural effect. 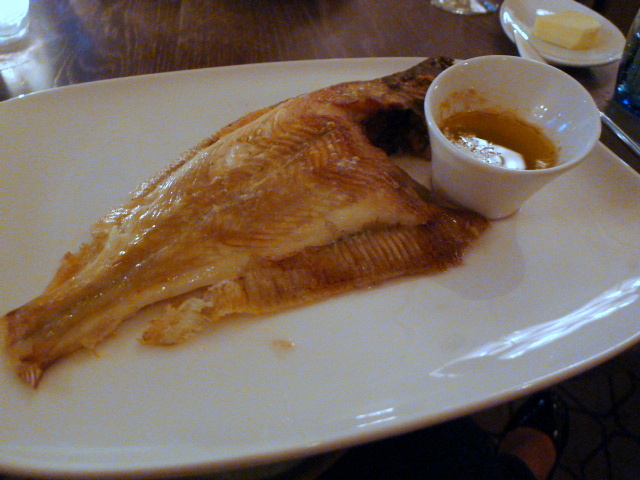 A grilled whole fish grill of the day of plaice (£17.95) didn’t taste entirely fresh either. 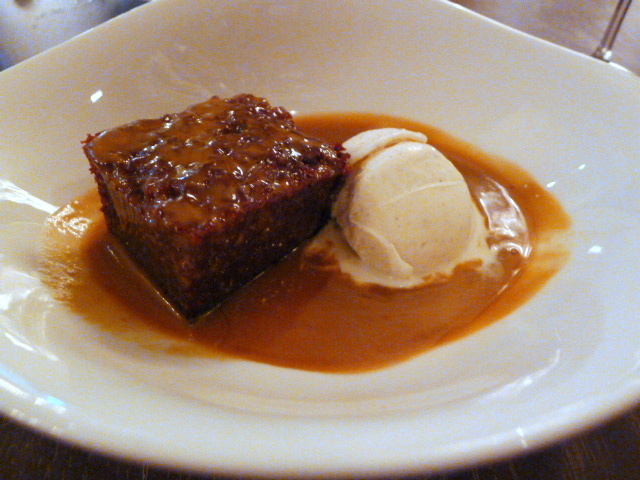 But desserts redeemed the meal with a glorious sticky toffee pudding paired with caramel sauce and vanilla ice cream (£6.50). The pudding was classy, being decadently moist and soft, and the sauce was lusciously rich with a lovely consistency. 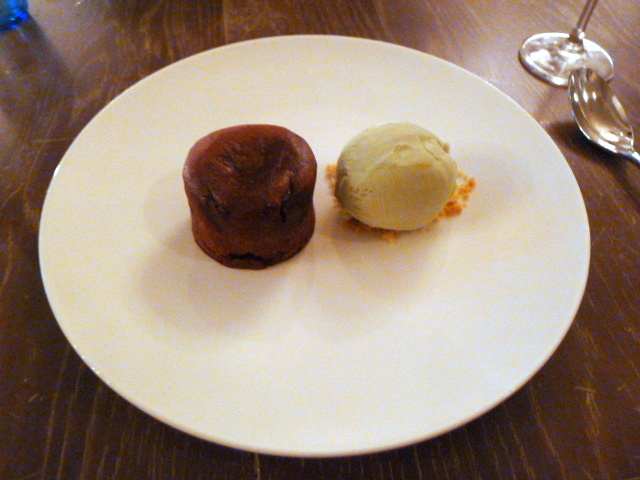 A dark chocolate fondant with pistachio ice cream (£7.95) was also extremely enjoyable with a runny, gooey centre. The ice cream was deliciously creamy, and its nutty overtones paired well with the depth of the chocolate. Breakfast served in The Upper Deck was a really pleasant experience. During dinner, when the light goes down, it’s obviously difficult to see the harbour. But daylight allows sight of the wonderful views. This combined with a tasty meal and a cozy setting made for a rather enjoyable way to start the day. Breakfast included a small buffet selection of pastries, cereals and juices, and there was a decent choice of cooked options. 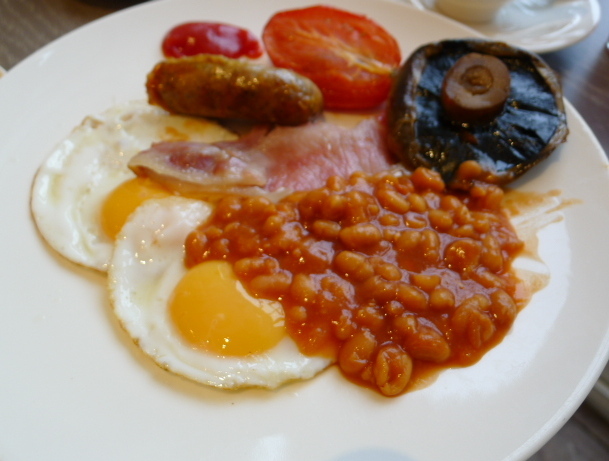 My English breakfast was really nicely done. There’s a coastal charm to the hotel that makes a visit to The Christchurch Harbour Hotel & Spa very pleasant. Dinner main courses aside, we really enjoyed our food, and there was enough strength in the cooking to suggest that our mains might just have been a dip in an otherwise solid dining experience. The wine list was varied with a number of decently priced options by the glass, and the service was laid back and relaxed.